This post made me smile. And he always ate them open-face as it enabled him to have twice the amount of peanut butter and brown sugar. I grew up in a household that considered all things sugar to be straight from the fire-pits of Hell. We didn’t even have honey, let alone (gasp) PROCESSED SUGAR. Consequently, in my pantry there are bags of several different types of sugars. And 3 different types of peanut butter, and I bake my own very whole grainy bread. I am filing this recipe (and it is a recipe, even though you don’t have it written down like they would in The Joy of Cooking) away for the day soon, when The Monthlies hit and I need (desperately) something sweet and salty. Your statement of it tasting like a peanut butter cookie banished all scepticism that was lingering. It is funny what we hold on to in our adult life, sometimes the sweetest treat comes with the best memories. I always wonder how much you ladies and gents remember of Gramma, we were lucky to have a few more years with her. I still eat my Shreddies with brown sugar coating the bottom of my bowl because of her. And my favourite memory at the kitchen table was her poking whichever one of us had our elbows on the table with a fork, it was usually Marie. Your grandfather sounds delightful also, I bet he was fun. Oh! I was expecting sugar and butter, like I had as a kid (on white bread). My husband (from Barcelona) grew up on olive oil and sugar. And now peanut butter and sugar! Actually, it sounds excellent. Olive oil and sugar sounds amazing, actually! I may try that on some day-old bread I’ve got, toasted, maybe with some lemon zest. Oh yum. I also ate sugar sandwiches, but mine were lots of salted butter and white sugar on white bread. Not nearly as good as peanut butter and brown sugar on grainy bread (yours sounds almost healthy in comparison!). I love, love the way you write. Your recollections are beautiful. 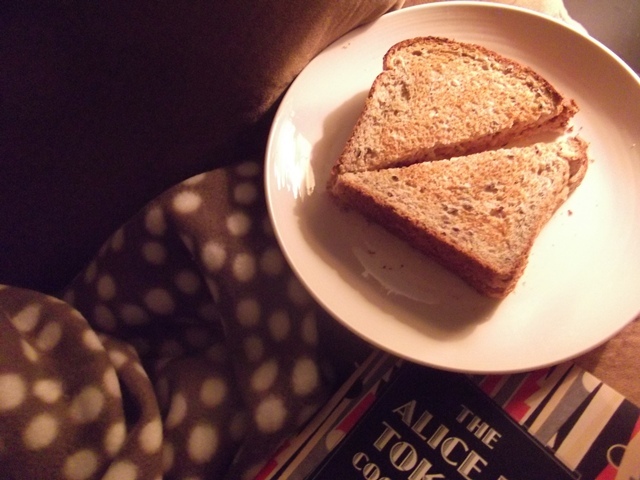 I’m going to make this sandwich, toasted, and sit down to contemplate the world tomorrow. I can’t wait. came here looking for butter sugar sandwich stories, learned about a new sugar sandwich. thanks you!! !